What makes a fishing trip great? Is it the size of the fish, the beauty of the setting, or the quality of the lake itself? Well, here in Southern Utah, Panguitch Lake has all of these things! This pristine body of water on the Markagunt Plateau features a variety of fish with gorgeous mountain scenery surrounding the shores. Whether you want to enjoy a day of fishing with your family or you need a day of peace and quiet out on the lake, our Panguitch Lake fishing tips help you make the most of your time on the water! Need more insider tips and information on all of the one-of-a-kind outdoor activities and attractions in the area? 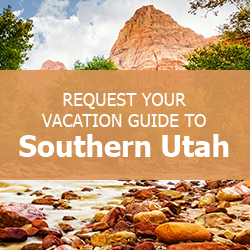 Request our free Southern Utah Vacation Guide! Panguitch Lake is known for its trophy-sized trout fishing, making it a great place for experienced anglers. However, if you’re in the mood for a casual fishing trip, or if you’re new to the sport, the stream below the lake provides plenty of fishing for beginners. It contains smaller fish that are easier to reel in and are usually biting. If you do venture down to the stream, make sure to pay attention to posted signs marking areas of private property. If you only heed one Panguitch Lake fishing tip, make sure you bring a set of great lures with you! Any angler knows that having the correct baits is key to a great fishing trip. When you are fishing on Panguitch Lake in the summertime, bring float tubers. Try pop gear and a worm if you’re casting your line from a boat. When ice fishing, use small jigs tipped with wax worms, Powerbait, or cheese baits. This one might surprise you, but it’s one of the best Panguitch Lake fishing tips we can advise you on before your trip. The lake is known for its excellent fishing and attracts anglers from all over to its teeming waters. It’s important that visitors do all they can to make sure the lake continues to be a great fishing destination. The best way to help preserve the waterway for future guests is to throw a few back! Enjoy the sport of fishing by using a “catch and release” method, or keep a few and let the rest go free. Extra Tip: Area fishing rules limit anglers to keeping a maximum of 4 trout. Two may be small cutthroat or tiger trout (under 15 inches), and no more than one may be a cutthroat or tiger trout of over 22 inches. Any non-rainbow trout between 15 and 22 inches must be released. After a full day of angling on the lake, head back to your Family Time Vacation Rentals property for an evening of relaxation before getting back out into the Southern Utah wilderness for more exciting adventures! We have an extensive list of premium vacation rentals, including a couple of scenic cabins overlooking Panguitch Lake! Our Scenic Panguitch Lake Cabin and Panguitch Lakehome both have four bedrooms and three bathrooms and sleep 12 to 13 guests! Each cabin has all of the quality and modern amenities you expect in a full-service vacation rental home in addition to sweeping views of the lake and its surrounding area. Ready to start planning your Southern Utah fishing trip? Check our availability and our area map to discover the bounty of national parks, nature trails, and adventures in our area! We look forward to having you!